This stanza from a poem read at Yizkor, Jewish memorial services, came to mind as we stood last week on the pastoral farmland on which the Battle of Gettysburg took place 150 years ago this July. The temperature had plunged 40 degrees, the wind blew, and the grass in the fields rippled with every gust. Perhaps nobody would recognize where a flower once grew, but there is no danger that the tens of thousands of soldiers and the one civilian who perished in this Civil War battle will be forgotten. Millions of people have made the pilgrimage to this tiny town in southeastern Pennsylvania to bear witness to the horror that took place here, in a war of brother against brother that nearly tore our nation apart. They reenact campaigns. 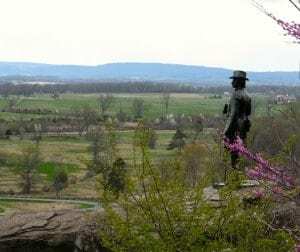 They climb Little Round Top and gaze out at the positions held by Confederate troops. 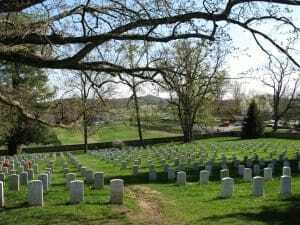 They look out from Cemetery Ridge and the Copse of Trees, trying to conjure the image of a mile-long phalanx of men in gray marching toward them during Pickett’s Charge. The battlefield is studded with square white stones that mark the left and right flanks of every platoon — from both sides of the Mason-Dixon Line. And dozens of monuments — beautiful sculpture and even a tower from which to view that bucolic farmland — honor the regiments from every state that participated in the Battle. They tour the David Wills House, where Abraham Lincoln spent the night before delivering his Gettysburg Address, an amazingly brief speech of only 272 words that has stayed with us for a century and a half. And, they visit the first national military cemetery established in this country. Magnolias in full bloom and trees leafing out make it a beautiful place, silent but for the birdsong and distant hum of traffic. It is a most fitting resting place for the more than 3,500 Union troops who gave their lives to ensure that slavery be abolished. The countryside around Gettysburg is spectacular, but it haunts me. That so much carnage took place in such an idyllic spot seems impossible. But it did. May we never forget where the grass grew and where the people died. Last summer, as the mint was taking over my garden, I contacted my friend Barb the Gourmet to ask her for recipes using the herb. There was just so much taboule I could prepare with the mounds of mint I was getting, and she was bound to have ideas. Barb did give me a couple recipes, neither of which used more than a couple tablespoons of the green stuff. So, in desperation, I began to tear the plant from the soil, knowing full well that it would be back the following summer, if not sooner. Of course, during the winter when I needed fresh mint, I had to buy a peppermint plant at the grocery store – it was much fresher and would last longer than the limp bundle in the herb section of the produce aisle. Loathe to waste anything, I watered it and kept it in the sunroom, where it thrived so well that I had to repot it. When a couple weeks went by with no further need for the herb, I had to pinch it back so it wouldn’t get leggy. I took the snipped-off pieces and put them in a glass of water – where they began to root. And grow. Again! The mint began to take over! Anyway, as this winter from hell seemed never to end, I developed the habit of comforting myself every afternoon with a big mug of hot herbal tea. I find that it goes really well with writing (I try to channel my favorite authors while sipping). One day, inspiration struck. No, not for a plot twist, but for tea. Why not harvest and dry the mint to make my own perfectly organic mint tea? Scavenging through my kitchen cabinets and drawers, I realized that I must have given my old tea infusers to one of the kids, so that is at the top of my shopping list this week. Maybe I’ll find a few other varieties of the herb to round out the collection: orange or lemon bergamot, pineapple, banana. Or how about chocolate mint? That should be good for inspiring something. A Proustian contemplation of Girl Scout cookies perhaps?